Gauteng Travel Guide / Stretching all the way from Pretoria in the north to Vereeniging in the south, Gauteng (Sotho for place of gold, although the ‘gaut’ is also thought to originate from the Dutch ‘goud’ for gold) was created by the ANC in 1994 after the country’s first all-race elections, uniting six regions, including part of the old Transvaal province, into what might be the smallest South African province, but serves as the gateway into Africa. 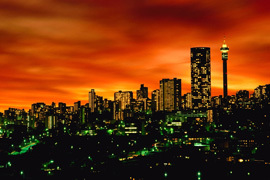 Whilst Gautengs history lies embedded in the discovery of gold, today Gauteng not only has one of the best infrastructures, but its population of over 9 million people form part of a vibrant mix of energy and diversity that make it one of the wealthiest provinces in Africa, and the entertainment epicentre of South Africa. The energy of the Highveld, with its intense summers broken only by intermittent electric storms, is echoed in the sheer buzz of the place. In Johannesburg people walk and talk fast, they drive at high speed too, and the ever increasing skyline – as glass and chrome structures rise like mushrooms seemingly overnight – reflects the rapid development that has taken place in the city in the last 10 years. There is more to Gauteng than the art of business and money-making. 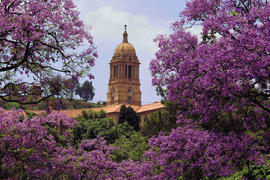 The Johannesburg Metro and the City of Pretoria – the two major cities in Gauteng – are diametrically opposed, and Pretoria provides a more laid-back, gentrified alternative – its jacaranda lined, wide streets and lovely old buildings a more sedate choice for many who readily make the daily commute to Johannesburg. The Vaal River, which separates Gauteng from the Free State, provides a number of avenues of escape; the Magaliesberg Mountains, virtually on Johannesburg’s doorstep, another effortless flight into days of heady blue quiet spaces; and Limpopo – just to the north of Gauteng, with its allure of game reserves, waterfalls, forests and streams – one more escape of note.